What’s the Urban Rebounding System? When you’re ready for a fun way to stay active from the comfort of home, feel great, and maintain a healthy weight, consider the urban rebounding system. The system includes a trampoline and provides low-impact exercises that are easy on your joints. Instead of dreading daily exercise, you’ll look forward to it when using the urban rebounder trampoline! What Does the Urban Rebounder Trampoline Look Like? The heavy-duty urban rebounder trampoline has a diameter of 40 inches and stands 10 inches from the floor. It comes with a sturdy stabilizing bar that’s attached to the trampoline for added safety while jumping. Its size is convenient for easy storage, but the trampoline is large enough to create an effective workout to get and keep you healthy for life. Who Can Use the Urban Rebounder Trampoline? The urban rebounder trampoline is designed for anyone to use in the convenience of their own home. It even works for people with limited mobility. Just gentle bouncing can stimulate lymph movement throughout the body. Athletes can also use it to tone up and get a workout. Instead of sitting sedentary while consuming media, consider bouncing on the trampoline. Staying in motion, even if not “exercising” is important for overall fitness and health. How Do I Use the Urban Rebounder Trampoline? When you purchase the urban rebounding system, you’ll receive an exercise DVD that includes three workouts. You can do one or more workouts in a day, depending on how much time you have, and change up exercise routines regularly. If you’re in the mood for continuous jumping while watching TV, that works great too! 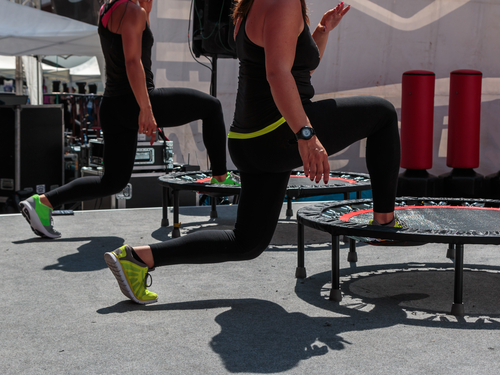 Add resistance training by using your own body weight, dumbbell weight, or resistance bands while on your rebounder. The trick is to avoid doing the same workout day after day by changing up your routine often. How Many Minutes Should I Use the Urban Rebounder Trampoline? 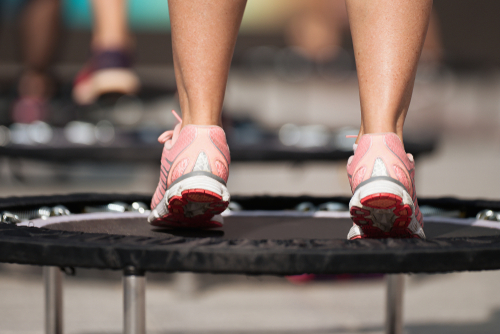 A little bit goes a long way when jumping on your urban rebounder trampoline. In fact, jumping just 15 minutes a day three days weekly helps you burn excess fat away and improve overall health. To keep disease risks as low as possible, it’s best to get at least 150 minutes of moderate-intensity exercise (up to 300 minutes to maximize health benefits) in weekly. Therefore, aim for about 30 minutes of exercise most days of the week. What Are the Benefits of the Urban Rebounding System? It improves coordination and balance. Regular cardiovascular exercise lowers your risk of heart disease, obesity, diabetes, cancer, and other chronic diseases. It’s low impact and easy on your joints. The urban rebounding system strengthens your core. It helps you increase cardiovascular endurance and boost muscle definition. Once you own the urban rebounder system, working out regularly is quick and convenient. You don’t even have to leave the house! Watch urban rebounder workout DVDs as you go or complete your own moves while watching your favorite movie to make the time pass quickly. What Are Some Common Rebounder Exercises? Change up the jumps you’re doing every few minutes during workouts. The more variety of exercises you include, the better results you’ll have! Why Are Diet and Supplements Important? Diet is just as important as exercise when it comes to getting results from urban rebounder trampoline workouts. Following the Hallelujah Diet, an entirely plant-based meal plan, helps you slim down quickly, increase muscle definition, maintain a healthy weight, and drastically lower chronic disease risks. Taking Hallelujah Diet protein powder supplements helps ensure you’re meeting daily protein needs, which are higher when you working out regularly. The protein powders are organic, entirely plant-based and taste as delicious as they are nutritious. Drinking protein shakes after workouts helps you build or maintain lean muscle, increase satiety to curb junk food cravings, and increase your body’s metabolism to improve muscle definition. When you’re ready to look and feel your best and get the results you desire from the urban rebounder trampoline, purchase the urban rebounder system today and begin, or continue to follow, the Hallelujah Diet! "Health experts" warn consumers to stay out of the sun, but that can lead to a vitamin D deficiency. This is a great article. Rebounding sounds like a great way to help get me in shape after having my 2nd daughter.